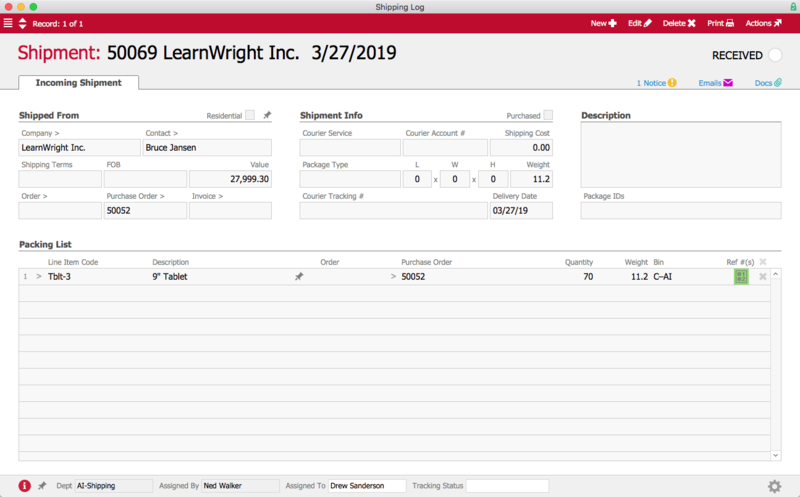 Managing inventory well involves a lot of moving parts – especially when you need to know exactly which specific units are going to whom. aACE allows you to track products by lot or by serial number, giving you the traceability required to handle product recalls, warranty claims, and other requirements linked to specific units. 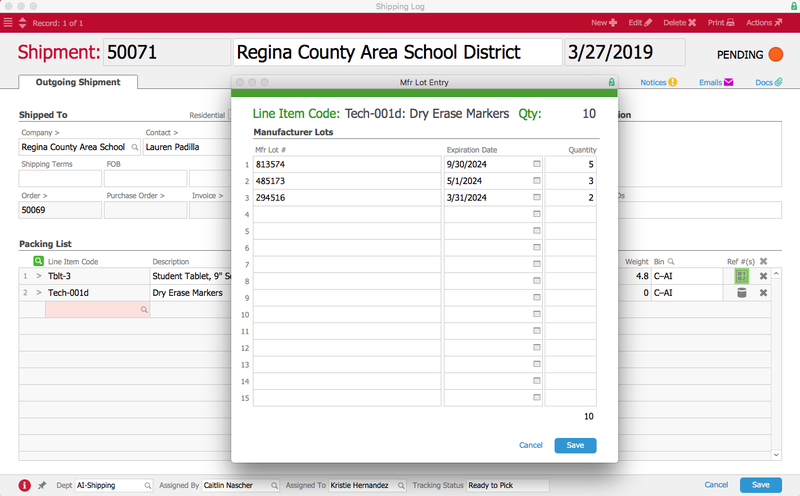 To understand how aACE tracks lots and serial numbers, let’s take a look at how our fictional company, aACME Education Solutions, uses these features in their day-to-day operations. aACME sells student tablet computers, which are tracked individually by serial number. In each tablet’s product record, the Serialized flag is checked. When a shipment of tablets comes in from the vendor, aACME employee Drew Sanderson fills out the shipment record in aACE. Because this product is serialized, aACE includes a space to enter the serial numbers received in this particular shipment. He clicks on the Serial Numbers icon in the Reference Numbers field and enters the range of serial numbers. He could also scan them in via a barcode scanner. 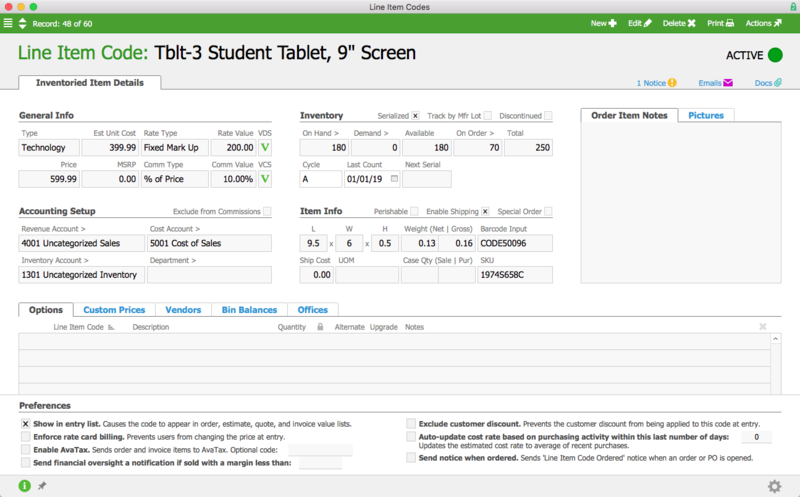 The Serialized flag makes this is a required field; aACE won’t allow Drew to process the shipment unless he enters a serial number for each tablet. After Drew enters those numbers, the Serial Numbers icon is highlighted in green to show that the field has been populated. He can now process the shipment, letting aACE know it’s been received. aACME also sells dry erase markers, which are tracked by manufacturer lot. In the markers’ product record, the Track by Mfr Lot flag is checked. Because the markers expire after a few years, the Perishable flag is also checked. When a shipment of dry erase markers comes in, Drew again fills out the shipment record in aACE. 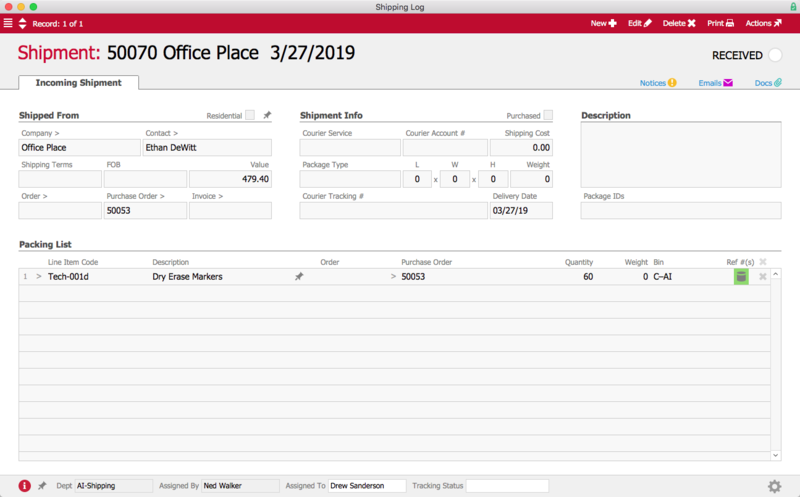 When Drew clicks the Lot Number icon, he is able to enter the lot numbers, expiration dates, and quantities of each lot of markers in this shipment. He could also scan them in with a barcode scanner. As with serial numbers, aACE requires Drew to enter this information in order to process the shipment. When Drew finishes entering the lot information, the Lot Number icon is highlighted in green. He is now able to process the shipment, and the shipment record’s status changes to Received. Now let’s see what happens when an order is placed. 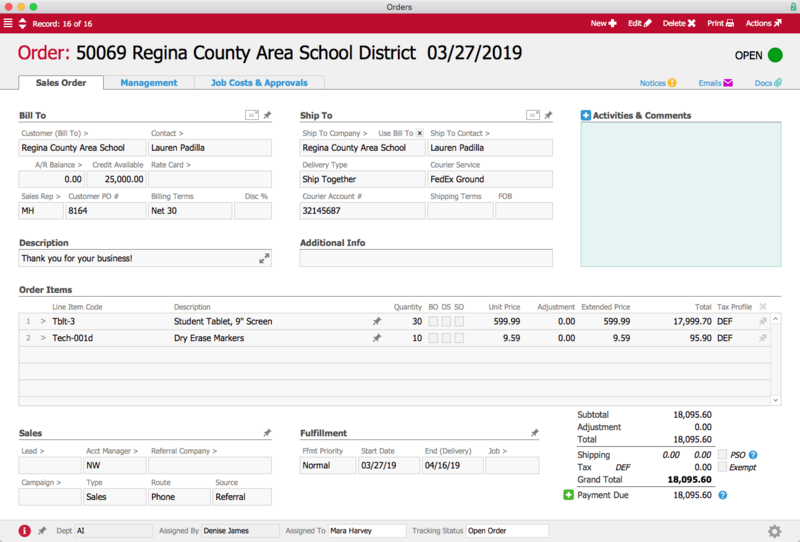 Over in the Sales Department, Mara Harvey receives an order for 30 student tablets and 10 packs of dry erase markers from the Regina County Area School District. In the warehouse, aACME employee Kristie Hernandez prepares the order to be shipped. To process the outgoing shipment, she must enter the tracking numbers for both tablets and markers. For the tablets, when she clicks on the Serial Numbers icon, aACE gives her a list of the serial numbers for all tablets currently in stock. Kristie can scan in each tablet with a barcode reader or choose the applicable serial numbers from the list. After she has entered and saved the serial numbers of all 30 tablets, the Serial Numbers icon is highlighted in green. Next, she clicks on the Lot Numbers icon. This opens the Manufacturer Lot Entry screen, where Kristie can choose lot numbers from a drop-down list that tells her which lots are available and how many items are in each lot. 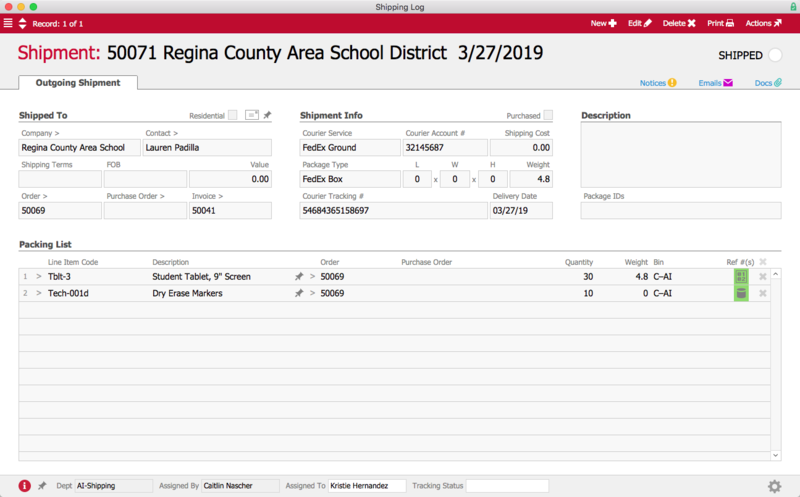 When Kristie chooses a lot, aACE automatically populates the Expiration Date field with the date that was entered when the lot was received. Kristie then enters the quantity of items from each lot. 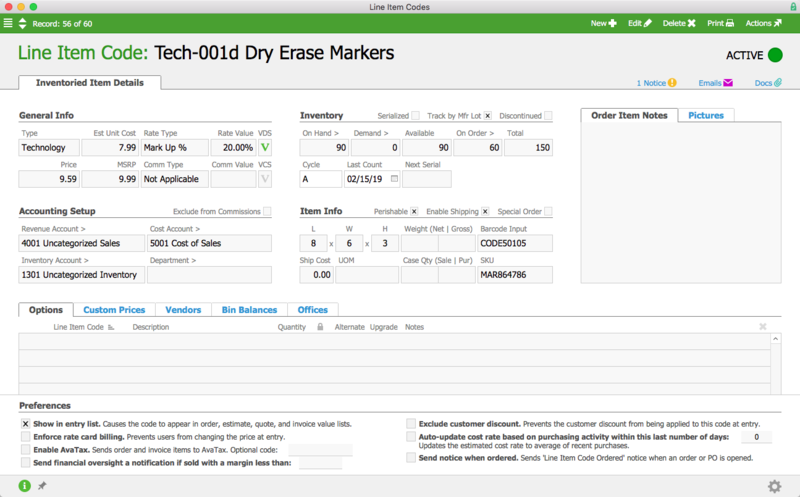 If the shipment includes dry erase markers from multiple lots, she can enter each lot either manually or by using a barcode scanner. When she finishes entering the lots, the Lot Numbers icon is highlighted in green. Now that all the tracking information is entered, the outgoing shipment can be processed. But what happens when aACME needs to locate products from a specific lot or a particular serial number, for instance because a recall has been issued? This is where aACE’s Inventory Transactions module comes in. 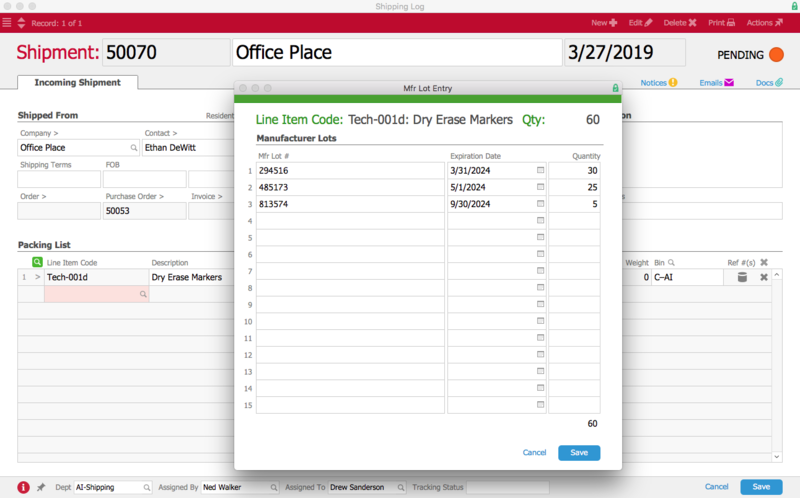 When aACME manager Denise James receives word that the manufacturer of the dry erase markers has issued a recall on lot #485173, she opens the Inventory Transactions module and performs a quick search. Immediately, aACE generates a list of every transaction involving the markers from that lot. Denise selects Orders from the Related Records link at the bottom of the screen. With one click, she can see all of the orders that are affected by the recall and take steps to recall the product. 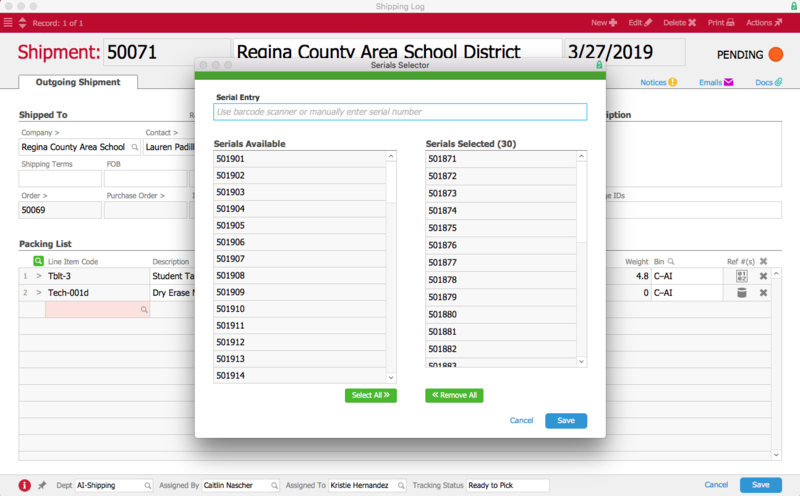 Likewise, if Denise needs to find out where a certain tablet is, she can enter the tablet’s serial number in the Quick Search bar and aACE will generate a list of every transaction involving that particular tablet. 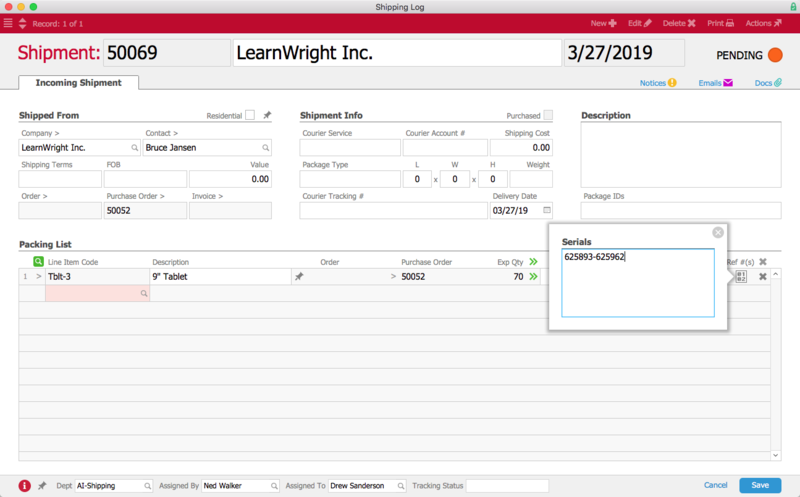 aACE lot and serial number tracking gives you better insight into your inventory, ensuring that you’re always prepared in the event of a recall or return. To learn more about what aACE can do for your business, check out our customer success stories or register for an upcoming webinar today.